Found this on the molds but no BC. 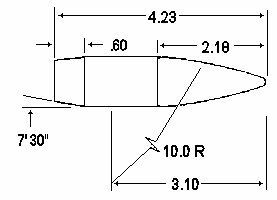 This is a gas check bullet not a flat base bullet a gas check shank worked like your rebutted boat tail this is the reason for using the G7 you are 100 percent correct about the flat base not doing what this bullet does . The .271 BC is right out of RCBS cast bullet reloading book. ( no longer in print) Yes this bullet was discontinued many years ago but you can pick them up on Ebay. I should call this the bumble bee bullet NASA says a bumble can not fly but it does just as this bullet is doing. You're probably correct Travis! All I want to know is, how many shots did it take to hit the target? Once sighted in, how many hits out of say 10 made it? There is a reason I ask. I've hit prairies dogs at over 1,500 yards more than once. I can't think of any time where it didn't take at least five tries. After sight in 4rounds 3 hits 1 miss first 3 hit last one miss so I called it a day,I was shooting in a 10 / 25 mile swirling wind with down draft at base of mountain and yes in this wind it was luck and skill both. I did try heaver bullets but with the factory 1/14 barrel the heavy bullets loose stability I can not explain why this bullet works so well but it always comes through. Your assumptions are spot on BOB.........Now way that bullet ONLY looses LESS than 200 fps in 1100 yds. As you know i have shot HUNDREDS of rds near and beyond 1000 yds with air and 2 very good bullets. Both Spitzers with GC bases. My G1 Hornady Ballistics are close with my 257's as his are in .308 using G1 model. Have shot thru 2 chronographs at same time and get good B.C. Works well to several hundred yds as I have posted before then after 600 yds the charts don't allow enough moa and at 1000 yds need around 15-20 more moa to be dead on. Pics below of my bullets that are just as sleek as his if not better.........85 and 92 gr spitzers in .257. I didn't argue in the GTA thread as I have placed more lead at long distance on steel with an airgun, than he has missed shots. And to believe that bullet is any better than pics below from MOLDS at Arsenal NOW and from ACCURATE in .457, isn't in tune with Reality. Bob come on out and use the sheet provided to you by me I will let you shoot the gun and we will start at 100 yards sighter dead on then you may count the clicks and shoot next target and see how close click count is ti real life we will go from 100 to 1201 targets are set up and readdy are you coming.? Your assumptions are spot on BOB.........Now way that bullet ONLY looses LESS than 200 fps in 1100 yds. As you know i have shoot HUNDREDS of rds near and beyond 1000 yds with air and 2 very good bullets. Both Spitzers with GC bases. My G1 Hornady Ballistics are close with my 257's as his are in .308 using G1 model. Have shot thru 2 chronographs at same time and get good B.C. Works well to several hundred yds as I have posted before then after 600 yds the charts don't allow enough moa and at 1000 yds need around 15-20 more moa to be dead on. I do not believe you have put more bullets down range but you may I average over 100,000 shots per year for the last 30 years what is your shot count per year? I do believe the proof is in the recovered bullets you have perfect mushroom bullets at what distance? NO WAY the bullets were recovered at 1108 yards your bullet has to be falling downward from over 200 feet above target with a .257 ? what is your trajectory at 1108 yards very simple question. I do not see this in the recovered bullets you are posting here, I see a slight downward smear on bullets nose there is no way they were recovered at 1108 yards unless you were 100 yards below said target? My bullet fragments show they are coming from a above angle the fragments were collected at the 1107 target which plainly show bullet coming into target from a above angel. I do believe it is funny you chose this forum to call me a phony . Well the ball is in your court you have the invitation are you man enough to take it ?